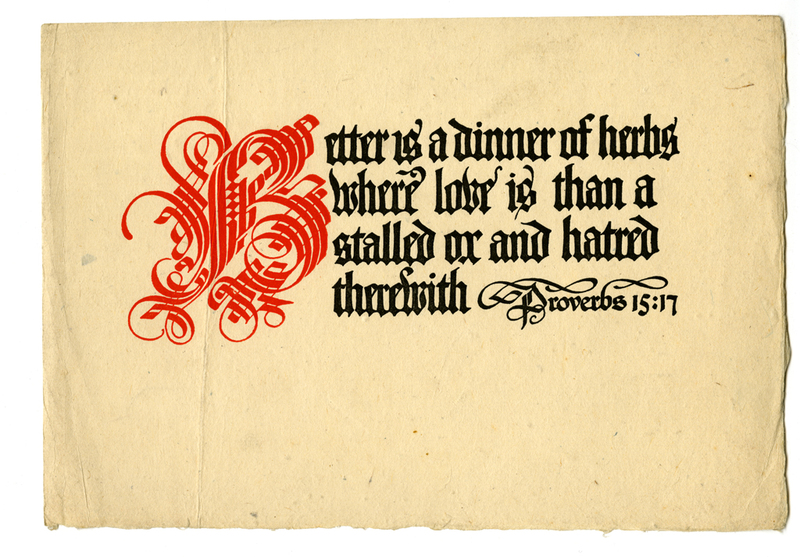 Proverbs 15:17 motto card (Alfred Bartlett, 1906). Design and lettering by W.A. Dwiggins. 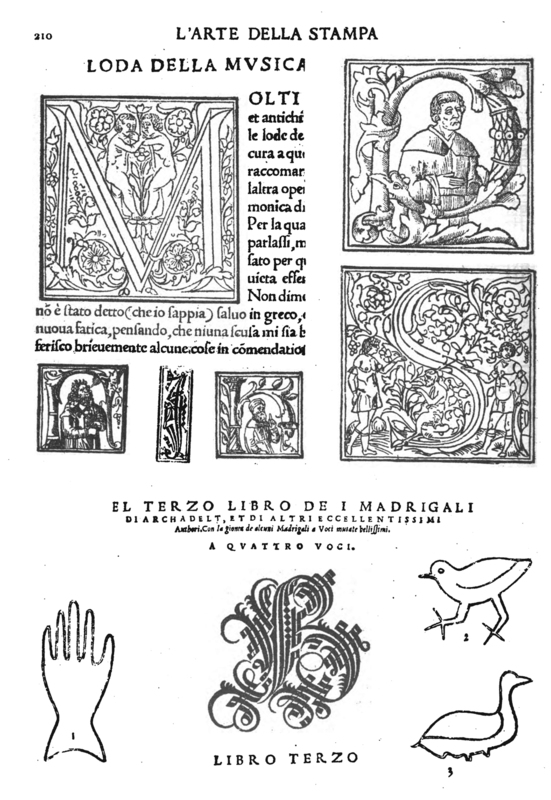 The motto cards were intended to be used as “decorative hangers upon the wall, either plain, in passepartout bindings, or in frames.” Dwiggins described his design of the excerpt from Proverbs 15:17 as: “An elaborate Italo-Gothic initial letter in red begins the Proverb, which is drawn in a vigorous black-letter.”  He improved upon his Venetian source, balancing the letter with additional swashes at the upper left, adjusting the size of the bowls, resolving the flourishes beneath the letter, and getting rid of the hackles. The result is a much more elegant letter. 1. Copies of the motto card are in Folders 9 and 10, Box 40, 1974 W.A. Dwiggins Collection, Boston Public Library; Folder 3, Box 5, 2001 W.A. Dwiggins Collection, Boston Public Library; and W.A. Dwiggins Folder, Series VII, Box 35, Carl Purington Rollins Collection, Robert B. Haas Family Arts Library, Yale University. 2. See A Catalogue of the Publications of Alfred Bartlett 1906 (Boston: Alfred Bartlett, 1906). The motto card also appears as no. 7 on “List,” an undated single sheet of items for sale by Dwiggins. The only known copy of this list is in the W.A. Dwiggins Ephemera Collection, Wing Collection, Newberry Library. 3. The quotation appears both in the List mentioned above as well as Bartlett’s 1906 catalogue indicating that it was written by Dwiggins himself.